TheHigh resolution, easy to handle interfaces as well as brilliant image quality are only three features that characterize the new ProgRes C12plus. The C12plus as the latest model in the ProgRes series expands the successful ProgRes C10plus by a model with higher resolution. It has been developed as a most easy-to-operate digital camera for a broad spectrum of image aquisition issues in industrial and scientific microscopy, with focus on image documentation, reporting and analysis. 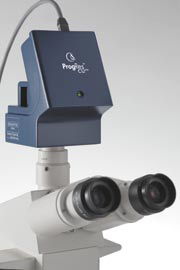 The ProgRes C12plus features a 5.0 megapixel Sony Super HAD CCD with microlenses and on-chip color mask. A a resolution sufficient for high quality everyday imaging issues. A range of exposure times from 0.2 milliseconds up to 180 seconds provides scope for most imaging issues. The A/D conversion of 12 bits per colour enables the ProgRes C12plus to capture even finest colour nuances - see all the details of your specimen. Of course, also the C12plus incorporates JENOPTIK's profound know-how in precise colour reproduction. The image result is an optimum prerequisite for detailed image analysis and for all possible output media from screen to print. A modern IEEE1394a FireWire interface offers speed and flexibility: the adaption of a digital camera has never been so easy. You just need to plug in a single cable to make the ProgRes C12plus ready for operation. Its 400Mbit/s FireWire interface connects the ProgRes C12 to a desktop computer or a laptop - power supply included. Hot plugging and OHCI compatibility make the ProgRes C12plus to your first choice when it comes to integrating a digital camera into your laboratory equipment. The C-mount connector attaches the well-designed camera to your microscope by a standard TV-adaptor. You can also attach standard C-mount lenses for using your ProgRes C12plus for usage on copy stands for macro-photography. ProgRes C12plus and ProgRes C10plus are delivered with easy to use ProgRes Capture Basic image acquisition software for MS Windows 2000/XP based computers. The TWAIN plugin that integrates neatlessly into most image processing applications, the stand-alone application operates the camera independent of third party software. .
A videolike live-image with full colour control, automatic exposure and easy white balancing are just a few of the ProgRes Capture Basic features that facilitate your everyday work. From image capture and color adjustment up to image storing: the camera software provides helpfull tools that help you capturing best possible images. This design and related specifi cations are subject to continuously ongoing development. We reserve the right to make changes in the interest of technical progress.